Before I start my review, here are a couple of the bands I listen to in order for you to get a better feel for what I based my review on. The genre was mostly Alt. Rock and here are a couple of the bands I listened to: The Killers, The Offspring, Bad Religion, a bit of Daft Punk (For bass tests), Foo Fighters, and of course Weezer. 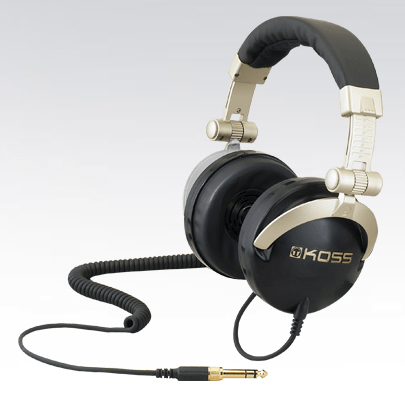 When I received the Koss MV1 Stereophones I was even impressed by the slick look on the outside. Once I opened the box I was glad to see that there was a nice case included because when I invest the money for headphones, I want to have them protected. This case is extremely sturdy, and protective. For comparison the Koss MV1 case is like a larger Bose Quiet Comfort Case. They also threw in a 6.3mm adapter which can be very useful for DJs. Looks are important when buying headphones, and these sure meet the standards. The MV1s have a very stylish charcoal with a touch of gold. This set is over the ear style and have closed backs. This design was purposely made by Koss in order to reach out to professionals looking for pure performance, such as DJs, recording artists, or for people who just flat out love music. The headphones: This set is unfortunately full plastic although they look like parts may be metal. On the other hand though, the plastic is very durable, and does not seem as if it would break anytime soon. Also, the headphones boast high quality leather pads on the sides, as well as on top giving it a quality feel. The headphone cord is an impressive 8ft coiled up. Having the cord coiled helps because there are simply no tangles, and also the full 8ft is reduced to about 4ft. The coiled cord also allows thicker wires to run through them without being too noticeable. The design of the headphones also plays a part in the sound by isolating the user from ambient sounds because of the over ear style and suction of the cups. This helps a lot when traveling on airplanes, or taking long car rides with people who enjoy listening to Mamma Mia. Although the MV1s are on the larger size, this does not affect the portability. For those afraid they will not be able to take these traveling, think again. The MV1s fold flat and fit slimly into the included case. On a side note, these headphones did not get too hot on my ears or too sweaty in comparison to my Bose Triport On Ear Headphones which was a pleasant surprise considering that they encase the entire ear. The Koss MV1 Professional Stereophones have very pleasantly sounding vocals, and a resounding bass to back it up. The downsides I found for the MV1s were the full plastic body, and the large size, but the sound quality clearly makes that a small matter. The MV1s are a great choice for professional musicians or anyone who really just wants to listen to some quality music.